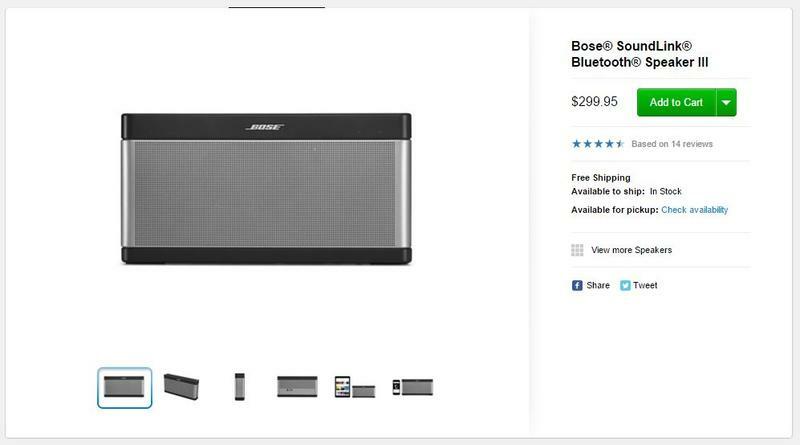 A number of Bose products have returned to the Apple Online Store after being removed almost two months ago. The company's popular SoundLink Bluetooth speaker is one of three devices that are now available ahead of the lucrative holiday shopping season. It's still unclear why Apple ever pulled Bose products from its stores, but it's thought the Cupertino company's purchase of Beats — and a recent legal battle between Beats and Bose — may have been a contributing factor. The Bose ban didn't last all that long, though. Just eight weeks later, the Bose QuietComfort earphones, SoundLink Bluetooth speaker, and SoundLink Mini Bluetooth speaker can all be purchased from Apple.com once again. Apple has even reinstated the customer ratings and reviews that these products had previously acquired. Recent leaks had suggested that Apple would be selling Bose products again before the holidays, and it's likely they will now remain available for the foreseeable future. All three offerings are available with free shipping in the U.S., or you can choose to collect them from your nearest Apple retail store.